Professor Mazzotta introduces students to the Divine Comedy, focusing on the first four cantos of Inferno. Stylistic, thematic and formal features of the poem are discussed in the context of its original title, Comedy. The first canto is read to establish the double voice of the poet-pilgrim and to contrast the immanent journey with those described by Dante’s literary precursors. Among these is the pilgrim’s guide, Virgil. The following cantos are read with special attention to the ways in which Dante positions his poem vis-à-vis the classical tradition. The novelty of Dante’s otherworldly journey is here addressed in terms of the relationship, introduced in the previous lecture in the context of the Vita nuova, between love and knowledge or, more precisely, between their respective faculties, will and intellect. Professor Giuseppe Mazzotta: We’ll begin today with Inferno. Let me say a few things about the poem in general, the structure of the poem, the formal structure, and then we get into the cantos I, II, III, IV which have been assigned to you. I already, in passing, in my introductory remarks, I did say something about the title as you recall, the title of the poem. The poem, we refer to it as the Divine Comedy, it should be “Comedy.” That’s what Dante calls it and he called it comedy for a number of reasons. The first reason is that it ends in — with — in happiness. It’s a story that begins with a kind of disorder, catastrophe if you wish; the pilgrim was lost in the woods and then works himself out toward the light, toward the truth, toward God. That’s — so comedy describes the thematic trajectory of the poem. It’s going from one condition to another, and from this point of view, it’s literally the opposite of the tragic movement. In the tragic movement, you always have some kind of initial state of cohesion or initial state of happiness that then goes on — going toward some kind of fatality or disaster. There’s a second reason for the title “comedy” and the second reason is stylistic. Dante, he calls it a comedy because he adopts the vernacular, first of all. As opposed to — the possibility would have been writing it in Latin in a kind of — the language of philosophy and the language of great cultural exchanges but he calls it — instead he uses the Italian vulgar language. It also means that stylistically he adopts a humble style. You know what the theory of styles is coming to us from ancient Greece and Rome. There are three levels of styles. Three levels of style: there is the high tragic style or the sublime style that describes exactly the events that involve kings since style is — must have some kind of aptness to the situation that the story describes. Then, there is a middle style or an elegiac style, and then there is a low style, the style of comedy, the style that indeed Dante will adopt lowly; but this is a kind of peculiar implication for Dante to call a story such as his, a “comedy” and this is the implication: that, in effect, he undercuts the idea of a rigid hierarchy of reality. The other thing I have to say about the formal structure of the poem, as you all know, it’s divided into three parts: Hell, Purgatory, and Paradise. Easy. Each of them has thirty-three cantos, with the exception of Inferno. Inferno has thirty-four cantos, which means there’s one — Canto I, which we are going to read in a moment, plus thirty-three. They are neatly separated in that, Canto I represents and stands for a kind of general rehearsal. It’s a journey that fails. Dante — the real journey will begin with Canto II. And so the Divine Comedy has to duplicate the symmetry and the order, and the harmony that he thinks he sees in the universe. The poem is presented and introduced as a reflection of that superior, divine order of the universe and wants to be part of it. So it’s both as this kind of ambivalence to reflect it and become what we call a metonymy: the part that wants to be attached to a larger whole. So these are the — some general concerns that you’ve got to have about the poem, some general ideas that will help you understand the pattern of parallelisms that we’re going to find within the poem. And I can give you one very quickly now. Since I’m really asking you that when you read the poem, you should be aware that it’s a kind of linear structure from 1 to 100. And yet, within the triple — the tri-partition of the poem — Hell, Purgatory, and Paradise — there are cantos that correspond to one another. Canto VI of Inferno, it prefigures Canto VI of Purgatorio and both of them in turn, will prefigure Canto VI of Paradise, Canto VII and so on. It can be done, Canto X, X and X, it can be done in a fairly systematic way. If you wish sometimes you could really read I, II, III, IV and yet I, I, and I which is — or maybe you wait for the end of the poem when you have read the whole poem then you can go back and read it horizontally as it were as much as vertically down. These are some ideas, general concerns and implications in Dante’s structure of the poem. We begin now with Canto I; it’s a very well-known canto where the — it’s the general preamble — you know how the poem starts. It’s — I’m just reading the famous lines, everybody reads and everybody probably remembers. “In the middle of the journey of our life, I came to myself.” Those of you who have a different translation will nonetheless get the gist and the changes, the shifts are really minimal. It’s a great beginning. It begins in a very extraordinary way; it begins with — in the middle to begin with, right? That’s — the beginning is in the middle, the beginning is the present reality of the pilgrim who finds himself lost, but it’s more in that first line. “In the middle of the journey of our life” — what is he saying? I think it’s fairly clear the first conceit and the fundamental conceit of the poem is that life is a journey, which means that we are always on the way. I don’t know where we are going yet. He will find out soon, which means that we are displaced, which means that we are going to have a number of adventures. It means that we are not yet where we want to be. Life is a journey. In fact, he will go on — not only go in the middle of the journey; he also calls it our life. That possessive, “our” life, it’s his way of establishing one fact, that this is not really yet a unique experience. It’s something we all share and something which might also concern us. That we are also, not only he is in the journey of his life, but we too are in that journey of — the common journey of our life. Then in contrast to that, there is now an autobiographical focus. There is a stress of “I found,” “I came to myself within a dark wood” and so on, “I,” so this is going to be very much the story, once again, very much as the Vita nuova, an autobiographical story. It can only be a personal story, but here the self is going to see the world — is going to see himself through the prism of the world. He will enter a public space. The great difference, I will say, between the Vita nuova which we just looked at last time, and the Divine Comedy is the following. The Vita nuova was destined to fail as a narrative, exactly because the protagonist went on drawing us and drawing himself within the solitude, the interiority of his own life; a life which was completely disengaged from the concerns for the outside world. The Divine Comedy starts exactly with that kind of shipwreck, the shipwreck of some other intellectual activities that he will go on describing and I will describe with you. As soon as we read this first line, “I came to myself in a dark wood,” and if you read a lot of traditional commentators, traditional commentators will tell you, oh well Dante is here in a state of sin, the dark wood is really the condition of spiritual — maybe despair. He’s at an impasse; we know he doesn’t know where to go. I think that this allegorizing is a little bit too easy and it’s not really — we have no evidence for this in the poem yet. We don’t know, but what we do know is that Dante is lost in a landscape that is terrifying. He is caught within it; he’s clueless about how he got there. I don’t even know how — he goes on to say, I don’t know how I got myself in that situation, whatever that situation was, but he knows one thing that he wants to get out of it. He understands that. He does not yet know how he to get out of this situation, but he knows that he has to get out of the entanglement of the wood. Then he goes on, oh how hard it is, etc., “so bitter is that death is hardly more. But to give account” — that’s the next tercet — “of the good which I’ve found there I will tell of other things I noted there.” In a way, the poem is already over. He’s now shifting from the narrative of events: I was lost in the dense, savage, harsh wood of the night. His gaze rends this night, tries to find out; he cannot see anything beyond himself, and then immediately says, but to tell you the good I noted there I have to tell you other things. The poem has, right from the start, the double narrative focus. The first focus is that he’s going to tell us the story of a pilgrim who is caught in the — what we call the diachronic, the time-bound, the daily events — a number of encounters which he cannot quite decide as to their meaning. So he’s led by Virgil as we’re going to find out soon, but he doesn’t understand what’s happening to him. Then there is the second focus and it’s the focus of the poet who has seen it all and enjoys what we would call an omniscient perspective. The whole poem really moves around this double axis: the axis of a synchronic view, synoptic view of the poet who has seen, who has — he becomes a poet because the pilgrim has had this experience, and then he goes on telling us about this experience. That’s what I call a synoptic and omniscient narrator and then he looks at the — at what the pilgrim did not know. There’s a kind of irony in this discrepancy between the diachronic viewpoint of the pilgrim and the synoptic viewpoint of the poet. It goes without saying that the structure is not that neat, you will see that there are moments when Dante will go on — one’s point of view will encroach upon the other, so I will tell you more about this particular structure and now he starts this narrative. Let’s see what has happened. “I cannot tell how,” this is the second paragraph of our translation, “I cannot rightly tell how I entered there, I was so full of sleep at that moment.” It’s a kind of torpid lethargic, the lack of consciousness, the lack of any — everything — his faculties are dormant — let’s paraphrase it like that. “When I left the true way; but when I reach the foot of the hill at the end of that valley which had pierced my heart with fear I looked up and saw the shoulders already clothed within the beams of the planet that leads men straight on every road.” What he does — dawn has come, dawn breaks, and he looks up toward the sun believing that the natural sunlight is going to unveil to him the layout of the land and he may find an escape route from this particular disaster. I’ll tell you one thing, that if this were a Platonic narrative the poem would come to an end right here, because this is what happens in a Platonic narrative. You are in a cave, you know we are all — this is a famous myth of the Republic; we see nothing, we only see flickers of light, it’s like being at the movies, flickers of light, unreal. They are simulations of the truth; they are being projected on the side of the cave, and we mistake those shadows for realities. If you are really wise and you are a philosopher then you do know that you can turn your neck around and find out where the source of true light is and then you are saved. The whole experience of the cave is predicated on this premise: that knowledge saves you, that knowledge is virtue. And knowledge does save you to the extent in which it really can heal what one could call the wounds of the intellect: ignorance being the wound of an intellect which knowledge, learning, education, philosophy, can really cure. Dante will find out very quickly that that is a false promise; that in many ways, there are realities and that his own realities are going to be a little bit more complex than what one can find in books, manuals of philosophy, about how we get saved and how we can save ourselves. Through the whole passage, I have to tell you, the two paragraphs we read is replete with neo-Platonic language. He is talking about himself as if this were a flight of the soul, flight of the mind. My mind which was still in flight, this is the idea that we have experiences which are purely intellectual, the kind of experiences that we can all find when we are reading a book, we are studying, we are thinking. The mind takes its flight; i.e., this is an intellectual problem. There are many other terms here that remind us of the — his use, his deliberate use of neo-Platonic language. For instance the word wood which is in the Latin — in the Italian is selva, which translates the Greek hyle, which as you know, is the primal matter out of which the demiurge will form and shape reality. He has been just now talking about the flight of the mind; “my mind was still in flight.” It’s an experience of a shipwreck, first of all, that many epic stories begin like that. Think of the Aeneid, the shipwreck of Aeneas on the shores of Africa as he is about to enter the city that Dido is about to build and that will bring him to a great revelation and a great love story with Dido. Here there’s no such a relief for him. It’s the shipwreck of the mind, a mind that seems to be literally unable to define both his whereabouts and his destination, but as soon as he does this, as soon as he understands that that’s what the problem is, he shifts the language from mind to body. “My wearied body,” and this is the great difference between neo-Platonic narratives and Dante’s kind of experience. The intrusion of body and what is the body — what does the body stand for? The body stands for the limit of purely intellectual journeys. The real journey that he has to undertake is the journey of mind and body, and the body stands for the irreducible historicity of one’s self. The body stands for one’s own reality, the passions; it stands for one’s own will. This is the difference between what the Greeks understand as the great intellectual adventure, which is one of knowledge, and Dante’s idea that the real problems are problems of the will. We may know all where we are and we all may understand that we are not happy with the situation that we find ourselves with, but we cannot quite solve it by knowledge because the problems are problems of willing. What is he doing? Let me just try to make this very simple. There are two schemes, I’m really simplifying it too, because I think this is dramatic enough in and of itself. I don’t have to overdo it with unnecessary complications. There is a Socratic scheme whereby all issues are issues of intellectual sorts. I know, and therefore I am virtuous. I know what justice is and the implication is: I’m just. That’s a false implication because if I go around the room here and ask you all to give me a definition, of each and every one of you of justice, you’ll all tell me something: that justice is a justice within the self, that justice is a way I relate to my family, or justice is a way I relate to the city, or justice is a way I take care of the problems or whatever of the world that I find myself in. Dante will say this is not the knowledge of what — the definition of justice cannot make you just. The issue is one of willing, desire. The other scheme that Dante opposes to the Socratic idea that all issues are issues of philosophy or issues of knowledge is one of the will. In the Letter to the Romans, St. Paul writes, “The good that I will do, that I do not do. The evil that I would do that I do.” He draws attention to the essential existential problem, the problem of the self. My will is divided against itself. The only way I may know what to do, but I do not know really, I am not sure that I will, I will it. That’s the fatality of life. We all know what’s good. How many of us go around choosing and doing what we know it’s not good for us, it’s not the best in terms of our judgment of situations. So it’s willing and the perspective of the will becomes Dante’s perspective in coming to terms with the limitations of philosophy and intellectual knowledge. We shall see Dante talks about the will in a number of ways. Last time, talking about the Vita nuova, I began mentioning to you that the will is even better of course for him than unwilling, and yet the best experiences of life seem to be those of one does not want to happen to us; such as a dream, for instance, the dream of falling in love or sometimes in the death of the beloved. You don’t — he certainly did not want the death of Beatrice. It’s a way of understanding that unwilling is as compelling as willing. And yet he understands that as soon as he focuses on Beatrice as the figure, the real contingent historical figure of love, that he has to give a direction to his own desires, that he has to define the will — it’s — you understand what I’m saying? He understands that too. That’s already an anticipation of what — of the problems of the will. Now he starts exploring other problems, which we shall see, both as they relate to the self, to the psychology of the character, but also as they relate to politics for instance. To a vision of the world as an act of and the projection of our own will; that the world is the way we want it to be, and that men are too — to the way in which we relate to problems which are of problems — necessary problems, the problems of reality, etc. For the time being though, Dante takes the will as his own, or the body, his own perspective. He finds out that he cannot go up the hill that he has seen. Three beasts, just paraphrasing the text, a leopard, a she-wolf, a lion, and the lion and the she-wolf will block his journey up and so he’s going right back where he finds himself and he’s now back into the deepest despair possible because there seems to be now really no exit. Then he sees something, “when I was rushing down to the place below, there appeared before my eyes one whose voice seemed weak from long silence. When I saw him in that great waste,” and as you know, because this is the first words that Dante will say, the pilgrim, “have pity on me whoever thou art, I cried to him, shade or a real man.” These are the words taken from Psalms, “misere” — he’s prostrating — of King David, so he’s prostrating himself and I stress this because the voice, the Davidic voice will constitute an important strain in this narrative. How does Dante talk? That’s one of the ways and we shall see how discretely it will appear further down in the poem and now the conversation what he meets is — the fear he meets is Virgil. “Not man, once I was a man.” Look at what — we can stop a little bit to reflect on what this experience here has been like and can we define it in some ways. Dante finds himself lost in the landscape. He does not know how he got there. He mistakes the sunlight, the natural sunlight, as the light of truth by following which he thinks he can reach the plain of truth, up to the top of the hill, the top of the mountain from which he can survey the land and find the exit, find an escape, find a transcendence, we’ll call it. Let’s call it a way of getting out of that disentanglement. Then he comes right back. He sees the three beasts that we don’t know what they are. Are they sins? Are they dispositions to sins? They are animals and therefore they stand for animal projections of our desires, of his desires, the she-wolf, the lion and the leopard, that’s all we can see about them. Then he meets a figure that can’t even know if it’s a shade or a man. He’s dramatizing what a medieval thought, a medieval literature; it’s called the land of dissimilitude, the land of an unlikeness. He finds himself in a world where things are not what they seem. Where there seems to be a disparity between, let’s call it — let’s use the literary language, with the signs and things — signs and their meanings, things and what they stand for and part of this effort is to literally stitch this to, this break between signs and symbols, meanings and signs, stitch them together. First meeting then is with this figure by the name of Virgil, who will become his guide. No man, you know who he is. He’s the author of the Aeneid, but look how he presents himself. I think it’s crucial you pay attention: “Not man; once I was man, and my parents were Lombards, both Mantuan by birth. I was born sub Iulio,” meaning Caesar, which is true, “though, late in his time and I lived in Rome.” And he gives a biography of himself, a self-presentation in terms of his life, the historical circumstances and also his works. That’s what we call a miniature biography: a sense that I came into this world and somehow. This is what it all comes down to, this is really the sense of my birth, and he speaks about his own birth. “I lived in Rome under the good Augustus in the time of the false and lying gods. I was a poet, and sang of that just son of Anchises,” Aeneas, “who came from Troy after proud Iliam was burned. But you? Why are you returning to such misery? Why dost thou not climb the delectable mountain which is the beginning and cause of all happiness?” — meaning the Mountain of Purgatory that will take him to Eden — which is really what all things according to the biblical version of cosmology, all things started. This is Virgil, clearly, the poet. And the extraordinary recommendation, which I can tell you as a teacher, every teacher really would love, years after the students have been studying with the teacher, to give them this kind of great acknowledgement: how I remember your teaching. That’s what he does, very rhetorical; we’ll call it the rhetoric of capturing the benevolence of the interlocutor. It’s clear that the exchange between them and the recognition of Virgil is as a poet, and therefore I have to take a few minutes to tell you a little bit about this. It’s — because Virgil, we know, he’s the poet of the Aeneid, clearly the story of a journey, of a grand epic journey by Aeneas. We’ll talk a lot about it; I hope you’ve been reading that poem, if you haven’t already. That’s not the way he was known. Virgil was not known this way in, what we call the twelfth-century Europe, in the culture immediately preceding Dante’s time. He, Virgil, more than as a poet, was known as a philosopher. He was a neo-Platonic philosopher. That is to say, a neo-Platonic philosopher is one who had written a poem, but the substance of the poem was not the fiction about the burning of Troy, the journey of Aeneas to — as an exile who could go around looking for a new land with his father on his back and the kid — the Ascanius by his hand; it was nothing like that. It really had some philosophical depth. It was a way of acknowledging that poetry is capable of providing philosophical illumination. What was the philosophical message? I call it neo-Platonic, because it was just very much like what they thought was the Odyssey in that same time: the Odyssey, the story of Odysseus or Ulysses, who goes from Ithaca to Troy, and then after ten years of the war in Troy goes back to Ithaca. It takes him ten more years to do that. The neo-Platonists, the allegorizers, were viewing that poem as the metaphor for the journey and the experience of the soul. It was the story of the soul that goes from the point of origin, one’s home, one’s home is always — we call once home a place of one’s — where one’s soul is — when one can find oneself somehow and one is familiar, comfortable, whatever. He leaves Ithaca, goes to Troy, goes through life, and then he has to purify himself in order to go back, as in a circle, a neo-Platonic circle back to the point of origin. This is the neo-Platonic allegory of the Odyssey. They will do the same thing in the twelfth-century France. I could give you names if you wish: Bernard Sylvester, Fulgentius a little bit earlier, John of Salisbury who was an Englishmen of the twelfth century, who will go on writing about the Aeneid is the story of a hero who is born in Troy and then goes through the stages of life. Each book represents a stage of life: childhood, youth, maturity, with all the temptations of the flesh that happened with Dido and then he goes back to — arrives in Italy and that’s the Book VI. They would never really bother reading the other book. The Aeneid was viewed as a philosophical text illustrating the pattern and the movement of life. It was really telling us, and that’s really the promise of philosophical knowledge, that we all, like Aeneas, are born, but with care and prudence can reach the Promised Land. Dante changes this interpretation and he changes this interpretation by making and insisting that you — that Virgil is a poet. He replaces the philosophical promises with the idea of poetry in the belief that poetry is better than philosophy. That philosophy cannot quite reach the depth of immense light that makes two general promises for everybody. It tells that we can all be like Aeneas, going from Troy to Latium. And Dante says no; this is not really saying much, but saying at all about the reality and the individuality of my life. Poetic language is for him, the language that addresses these issues, and therefore, poetry here is seen as a version of history. This is — you are the writer, he says to Virgil, who wrote the poem dealing with Roman history. Poetry and history — they deal with the world of contingency and not the world of universal, and therefore, potentially empty promises. That’s the great change, the great new interpretation that Dante’s advancing about Virgil. What Virgil will tell him is that the — they go on talking about — Dante will call him master and author, this is — and great sage and all that. And Virgil says to him, this is very simple, you must take another road; you are going the wrong way. This is the — that’s what I call the idea that Canto I is a rehearsal to the whole poem. It gives the story of a journey, a journey that fails, a journey that is aborted, that’s not the way you go. It’s not — you find yourself lost, what do you do? You try to go quickly up to the destination, you climb up the hill and you think you can make it. No, no, no. Virgil replies that he has to go in a different way. That’s the end of Canto I and we come to Canto II, where now it’s — what’s the time of the year? If this has to be a historical, a reducible, and essentially a biographical experience, Dante has to be very careful. He will give us the time, the precise time and place of this experience. We are — the poem starts on Good Friday, on the evening of Good Friday of the year 1300. These are the — so it’s a very Christo-mimetic we call it, an imitation of Christ-like experience, because he will emerge to the light of Purgatory on Easter Sunday. First of all, these are the coordinates, the imaginative coordinates for his own journey. Aeneas, the hero who brings about the foundation of Rome and then Paul, the Apostle to the Gentile, the thirteenth Apostle who really brings about — who also goes to Rome, but he was also the spiritual domain of the Church. So these are the two — so who is he? That’s the first question he must answer. “I’m not Aeneas, I’m not Paul.” The implication is who am I? This whole part of this story is to find out who he is and part of this journey is indeed to find out — the beginning of this journey at least, is to find out that the poem is written in order to bring some degree of redemption and clarity to the world. He really believes in this, in what we call “salvific” role of his own voice. Not without irony, not without discouragement, not without a sense that this may indeed be a proud arrogant kind sort of posture. It would take me really too long to give you a sense of an appropriate gloss to these lines. They are lines about the limitations of willing. Dante begins by claiming the importance of the will in the act of knowledge and we do see that he so aware of it — there’s one detail that I did not mention. You realize how the pilgrim moves throughout in Canto I and he will move in the same way but he’ll never talk about it again. He hobbles in — toward the light, he goes around hobbling and that hobbling is part of his being wounded, having a wounded will that he must somehow heal. Someone will say, good, Dante’s a voluntarist, not quite. Dante doesn’t believe in philosophy and intellect, not quite. He believes that the two faculties of the soul, intellect and will, are like the feet of one’s body. They got to — if you really want to walk fast, at least, and safely, you got to be using both. You got to use the intellect and the will. As soon as he claims the importance of the will, which the Socratic experience had somehow neglected, he goes on reflecting about the limitations of the will. What are the limitations? One of it is that the will can be divided against itself. The second one is that the will needs something to regulate it, because I can will anything, I can will this and that, how do I order what I will? The third limitation of the will, and we’ll talk more about the — some of these aspects but there’s a third limitation of the will is that I can never really go faster than my own will. I’m a prisoner of my — if I believe that that’s all I have, my will — I can’t go faster than it. If the will is weak and slow, and divided, that’s what I am. I can’t go past it, some of the difficulties. Here he goes, Canto II, trying to think about the identity and the purpose of this journey — who am I? “I’m not Aeneas, I’m not Paul,” then who am I? That’s the great question and as soon as he does this, he admits — he sheds light on the first internal issue that he must cure, the internal issue is the divided will. He doesn’t even name them, he won’t even name them because to name them would be to bring them into reality and the neutrality stands and is a sign the way in which they de-realize the world. They reduce the world to a pure show of their own — for their own spectatorship. So, he goes on from here and now the second action is that he sees Charon the famous — he goes into the ferry, Charon who will ferry all the souls and gives an extraordinary description of this figure and the souls who blasphemed God and the parents, the humankind. I really want to focus on this image of the autumn leaves, whereby Dante describes the dead souls as the leaves in autumn that have fallen from the tree. The conceit is that the souls are leaves, and it’s an image that Dante takes straight from the Aeneid of Virgil. In Book VI, also Virgil describes — Book VI of the Aeneid, focuses on the descent of Aeneas into Hades and there he also waits and he sees the souls waiting for reincarnation, the famous theory of metempsychosis. You may have heard of this term, which means the reincarnation of the souls. The souls are waiting to be reincarnated and come back in an endless cycle. Dante — Virgil himself had taken this image from Homer, of course. Dante changes Virgil’s, the thrust of Virgil’s image, because in Virgil it’s quite accurate since he has a Pythagorean understanding of existence. That is to say, life is a continuous circle, the wheel of becoming, Plato’s wheel of becoming. Time goes on and on returning on itself. We always witness these circles and cycle of the seasons, and this is also what happens with human life. There is nothing really unique about us because we die and then we can wait for the reincarnation of our soul. Death in Virgil is an elegiac experience: it’s never really tragic and cannot be tragic, because it lacks that edge of the uniqueness, the edge that something particular and special has been happening to the world because I am here, certainly to my world, because I am here, and then I may disappear. Dante changes this idea of this circularity, the elegiac quality of death and life that we have in Virgil. Why do I call it elegiac? Because you die and yet you can come back, because we’re really like leaves: and just as leaves fall in the autumn, you just wait for the spring. We might not be the same leaves, but leaves very much like those that have just fallen will return. Look what Dante does. Dante goes on focusing on the idea of uniqueness of every leaf. For Dante, this image shows not that leaves are — our souls are like leaves, but that a leaf can be described as a soul only if you insist on its own uniqueness and the fact that it will never return. There is one fairly contemporary poet who understood this and I really want to quote to you a few lines. I don’t know that I remember them all, it’s Gerard Manley Hopkins. Some of you will have read — who read English literature remember this, you may remember this. He writes his famous poem, called Goldengrove Margaret. Do you know the poem? Do you know what I’m talking about? “Margaret, are you grieving of a Goldengrove unleaving? Leaves like the things of man you … care for, can you? As the heart grows older it will come to such sights colder,” etc. and continues. What is — Hopkins really is reading this image. What is he really saying? He’s saying he understands that leaves, like the things of man you care for, can you — what comes back that’s not the life of human beings, but comes back are the things that human beings may use and waste and those things. So the right analogy for Gerard Manley Hopkins, in a sense, really in the wake of Dante, is between the things of man, the things that we have, the things that we can produce and leaves, not souls. In formal terms, this really means that Dante is replacing the notion of epic circularity that you find in the classics, the classics of Homer, the classics such as the Aeneid, with an idea of linear novel. The life of human beings is best described formally by a novel in the sense that we are caught in a journey that goes on. It’s unique and will reach its destination whatever it will be. We don’t know yet, at this point, of the poem. Now Dante enters into a circle, into the garden, the first experience in Canto IV. I will — I want to give you some time to — I will have to deal with Canto IV and then I will stop. I’ll have to come straight to the point about Canto IV. Dante comes to what is called “limbo” the — a word that comes from Latin, in Latin it — that’s what limbo is, this is the edge, that’s what it means, lembos. In Italian you speak of the lembo, the edge of a dress or a jacket and so on; comes to the area of Hell which really is outside of Hell. In fact, it’s very much like the Virgilian after-life of the virtuous. And he meets a lot — it’s described as a garden, one of the gardens, one of the three, four gardens we find a sort of pre-figuration of the — in many ways of the earthly paradise and gardens in Purgatory, but it’s also pre-figuration of the world of Paradise where the city, Jerusalem, is described as a garden. The first thing about this: it’s called the locus amoenus in case you want to know what the technical term, locus amoenus, the kind of idyllic place, and this is a term, a phraseology that belongs to very much the epic world. And in the world, for instance, later in the Renaissance whether it’s — it could be Spencer or Tasso, or Milton, there is always the story of the hero who reaches this idyllic bucolic place and — to relax. It’s really a place of the breakdown of the errancy of the hero, of the adventurous spirit, and always shows, or maybe it’s just the irony in literary structures, that whenever heroes seem to look for a pause to the quest by reaching the garden and relaxing, that’s where they find out they are in the most dangerous situation. That whenever you think that you are safe and you can disarm, and there’s the running cool water of the river. There is the shade; there is the fragrance of the landscape, this is the way that we’re — the wherewithal, the description of these bucolic gardens, that’s exactly when the snake will appear. That’s exactly when the enemy will be capable of reaching you and overwhelm you. This is also — in other words there are all these places of temptation and that’s what happens here. As befits limbo. It’s clearly like life here. That’s what the after-life is in Dante’s conception. It’s only an extension of what we choose to do on this earth. If you really think that life, the beauty of life, which is not a bad idea, is talking about having endless seminars of aesthetics or poetry, as these poets do, that’s what your after-life is. You sit down, sit on the grass and go on talking about beautiful things, he says. “The good master began: ‘Mark him there with sword in hand who comes before the three as their lord. He is Homer, the sovereign poet. He that comes next is Horace, the moralist. Ovid is the third, and the last, Lucan,” famous epic poet whom Dante will again celebrate in Purgatory, “Since each shares with me in the name the one voice uttered they give me honorable welcome and in this do well.’ Thus I will assemble the noble school,” school in Greek means — it’s also leisure, the leisurely life, scholar, the world of play and the world of leisure, ” the lord of loftiest song who flies like an eagle,” Homer, ” above the rest.” And the irony, of course, is that he’s blind and the eagle to have the sharp view, the sharp vision, but that Homer’s vision is an inner vision. He looks — he’s blind because he’s looking inward in order to know what the song he is to sing will be about. Here is Dante. He inscribes himself in the history of Western poetry; from Homer to Dante, he counts himself as sixth among them. Here’s Virgil, here’s Lucan, here’s Ovid, here’s Horace, and of course, the master of them, all Homer. We go from Homer to Dante, it’s a little history, if you wish, of Western poetry and Dante thinks that he belongs to it. We could say a number of things about what they are talking about. He says he doesn’t say. We talk about beautiful things which we — I infer we can easily infer they talk about poetry: they talk about their craft. There may be a little link that I would like you to reflect on, on your own, between the garden and the kind of poetry, the kind of beauty that they are really talking about. Do you see the discrepancy? Do you see how this is jarring? Can you hear it? He is going down for redemption. He is descending in humility, and yet now he talks as a poet, his poetic voice is one that elevates itself. There seems to be a kind of discrepancy between the two, that’s the great temptation of Dante. To believe that as a poet he has been claiming that poetry is better than philosophy, that poetry is like history, and the first concern Dante has is to reflect on the wholeness of this claim. How this kind of claim about the importance of poetry can turn out to be a temptation for him. It’s a hubris and I focus on it, as I have focused on it, because in effect what we’re going to discuss next time. Canto V, it is an extended reflection, a way for Dante to reflect on this claim, an extended reflection on the dangers of such a claim and the responsibility of writing poetry. Dante will meet the great heroine of all love stories, Francesca. Everybody knows about this fantastic figure, a lovely figure Francesca who dies for love, but Dante’s actually encountering a reader of his own poetry and he witnesses the kind of traps and risk that reading implies. We are going to go on next time thinking about this whole question of reading and responsibilities of writing. “There before me on the enamelled green were shown to me the great spirits by the sight of whom I am uplifted in myself. I saw Electra with many in her company, of whom I knew Hector and Aeneas and Caesar…I saw Camilla, Penthesilea on the other side, and I saw the Latian king who sat with his daughter Lavinia; I saw Brutus who drove out Tarquin, Lucrece, Julia, Marcia, and Cornelia; and by himself … I saw Saladin,” a great sign of honor, Saladin who sits by himself as a kind of lofty state and, ” when I raised my eyes a little higher I saw the master of them that now sitting amid a philosophic family… Socrates… Plato,” the other one was Aristotle, “Democritus, Diogenes…” all the Greek philosophers and then Orpheus, Cicero, Linus, Seneca, Euclid, Ptolemy. A version of the classical encyclopedia: all of the knowledge is gathered here, and yet Dante has a way of saying that traditional encyclopedias, these formal structures as he wanted to organize the world of knowledge, there is something wanting about them. Why? What’s wanting about them? They never tell you how you can really educate yourself. They never describe the process of education. To know that to describe the process of education you go to have an encyclopedic poem where you are showing the phases and the stages of learning; as the pilgrim will it was the second thing that I have to say is that, in any enumeration as you have here, an epic enumeration, and I will close my remarks for the day. Enumerations always imply the wish of a narrative such as an encyclopedia, because it’s as little bit of an encyclopedic form I say, to encompass the whole of reality: that’s what encyclopedias want to do. The reality of it, the intellectual reality, and yet enumerations by their virtual being enumerations will tell you that no totalization is possible. There is something that always escapes the formal ordering that the encyclopedias want to reach. And for now I stop with my remarks and we have a few minutes in case there are questions, as I hope there are. I welcome questions. I will repeat your questions, by the way, for the benefit of the videotape. Please. Student: So when Dante talks about the first group of sinners who work for themselves who didn’t take a side, so you think that was also political commentary? Professor Giuseppe Mazzotta: Yes. The question is, Dante talks about the neutral angels. He calls them “for themselves” and we say it’s “by themselves” and the question then really is, is that also a political commentary? Before I could rephrase, I could repeat this — the question — I said yes, absolutely. Dante will use the very same experience for himself later in Paradise where he will say that in many ways being by oneself, there are times when that can become an act of virtue where the notion of neutrality is going to be redefined. Dante doesn’t like clearly neutrality, all right. Why is he — does he find neutrality? Because it’s a language of privation for him, it’s really way of — it’s the decision not to take decisions because you are always making a decision even when we think that we are not making a decision, so you really are. To him that is the sign of a great cowardice. He explains that in cosmic terms. This is the metaphysics the great war in Heaven, which by the way, enables me now to say that it gives the whole of Hell a kind of symmetrical structure because it clearly begins with the neutral angels and ends with the encounter — with Lucifer at the end. So you that this is really the kind — what frames the narrative of Hell. To go back to your question, when Dante is going to talk about politics, he also believed, for a while, that he had to take sides. He did, and he did by going back now to the few remarks about his language, his political involvement, on the first class, the first seminar. He was banned, he was sentenced to exile, and then he removed himself from all partisan politics. How did he do this and why did he do this? For a while he was a Guelf being thrown out of Florence with many others, also as an act of punishment for a decision he had made to throw out the Ghibellines, among whom his own best friend, Guido Cavalcanti, who died in exile. He’s thrown out, and we do know these historical happenings. They spend the first few years of their exile plotting and making, and going on through machinations as to how to get back to Florence and damn it, really make them pay. He realizes very quickly the wickedness of this plan. He realizes that his own party is no better than that of the Ghibellines and so he removes himself from them, the act of removal from the criminal violence that he and his other accomplices were for a while thinking about, turns out to be madness and so he decides in this act of virtue, absolute solitude and that is by himself. There is a kind of judgment, but let me refine that, how can you go on really describing that the act of neutrality is bad. And yet there is a way in which there are times where neutrality can become nothing less than a virtuous decision as he will make. Other questions? Please. Student: I have a question from last Tuesday’s lecture. Professor Giuseppe Mazzotta: Last — yes please. Student: Last Tuesday — you talked about friendship and love, love and [inaudible]. There was no conversation about lust, and we know from this history that both of them, Beatrice and Dante were married and that he had children and I’m wondering if the physical aspect above is irrelevant for the poet. Professor Giuseppe Mazzotta: The question refers to the remark I made about — that was picked up by a student also, another student, the remark about love and friendship as the two are dramatized in the Vita nuova. It refers — wants to know, wants me to explore more the role of lust, since we know that Dante was married and what does lust have to do with love. I take, that’s really the question. Let me just say that it’s a very complicated question and I will talk about this next time when we deal with Francesca, who is of course, the heroine of lust, if there was ever one. Then we’ll see what Dante means by that. I mean the — it clearly is an issue related to love, fundamentally related to love. But to believe and I’m really — probably have confused some of you here, but don’t be confused, to believe that Dante’s judgment of Francesca is limited to the representation of Canto V, where he describes the relationship between lust and love, lust and love, would be a grand mistake. Dante understands that without physicality there could be no love, that there’s no soul which is not connected to a body. In fact, some of the remarks that I made today are really about — can be construed — I did not make the point but it can be construed as his sense of the inevitability of the body, that the intellect in and by itself, the soul in of and by itself, without materiality, without some degree of being wedded to the body, is really not part of the human experience. This is what I was saying today about the fact that the journey is not only just an intellectual journey. It has to be done in the body; it’s part of the sense of the inevitability of the body. After all, this is really what his Christianity is about: it’s about the incarnation. It’s about the being embodied, about the divinity being embodied and therefore entering our human condition. Let me also say that Dante goes on thinking about Francesca. He condemns her and Francesca is always circling around in this state of permanent desire with power, in other words by moving around, they’re really describing their unquiet hearts. If you are — when you are at peace you just stop and sit. She just goes on moving around and around; that’s their punishment and yet, he remembers her. When Dante reaches the Heaven and metaphysics in Paradise and he has to talk about the kiss of creation, how creation — God creates the world by imprinting a kiss on the material that he had at his disposal. The language that he will use is going to be the language of Francesca and that to me means that the kiss of Francesca can also be construed as the existential encounter to God’s — ;the — God’s kiss on creation. It’s a way — I don’t think that he’s redeeming her, there’s no such thing as the redemption for the infernal souls, and yet there is an idea — there is something that may have gone wrong, and we’ll have to see what it is, and it’s not the lust. We have to see what the situation is; it’s not lust. I don’t think it’s only lust and that is part of — there’s something even larger about her. What — the mistake that she seems to be making is of a different sort and I’ll keep you hanging until next time so that — otherwise what’s the point? We have to look at Canto V. Let’s read Canto V for next Tuesday, but before you go, there’s some time so in case there are — we have a couple of minutes, other questions? Please. Student: In Canto I, when he is talking to Virgil and he says, “you’re the only one from whom my writing drew the noble stuff of which I have been [inaudible].” It’s really kind of a lie isn’t it? Student: So he’s saying that he’s — that he’s taken his style from him and that’s the style for which he’s been — for which he’s gained honor, but he’s not honored as an epic poet, he’s not — that’s not — what are the implications of what he’s saying because it’s really not actually true. 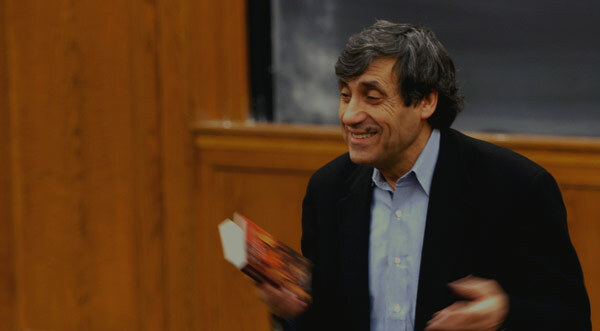 Professor Giuseppe Mazzotta: Okay, the question is, a reference to the encounter between the pilgrim and Virgil in Canto I of Inferno where Dante — in what I called the captatio benevolentia, what are captured in the benevolence of Virgil, the only living — he doesn’t even know if it’s a shade or a human being, turns out that he is a human being, he says, well you are the poet from whom I took the style that has honored — has made me honor. The sort of — the real question is, this is a little bit of a lie isn’t it, because Dante by this time is not really known as an epic poet. I would really say — call it a lie, say it’s part of the simulation, rhetorical simulation of — captured in the benevolence of the listener. At the same time it’s really an acknowledgement of Virgil’s mastery, and what is Virgil’s mastery? Dante really thought that his own poetry is — that Latin is not a dead language, that the vernacular is really the way Latin has become in time, so the continuity between Virgil and him is real, so there’s a kind of continuity of poetic continuity. You’re quite right that it’s literally — literally it’s not true. At that point, Dante’s more of a provincial poet or the poet who follows the stilnovisti, the poets of the Sweet New Style from Bologna and Florence and then Virgil. Thank you so much; we’ll see you next time.